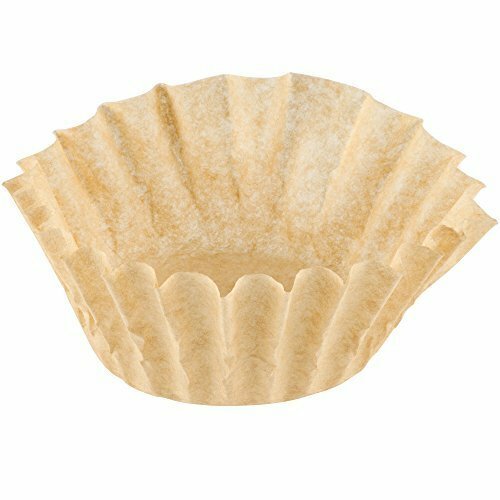 Enforce your eco-friendly objective right down to the smallest detail with this natural kraft coffee filter! Made from unbleached paper, this environmentally-friendly paper coffee filter is a great alternative to traditional bleached white paper filters. It's just as effective during brewing, and it fits perfectly in the coffee filter basket on your coffee machine. After the brew is done, it's disposable for fast, efficient clean-up that you can feel good about, since it's eco-friendly too! With a 9 3/4" x 4 1/2" size, this filter is designed for standard 12-cup coffee makers, making it a versatile solution for virtually any coffee shop, restaurant, or other dining facility with an eco-friendly edge. Like traditional bleached filters, it features a semi-permeable surface, passable by liquids, but not solids (like coffee grounds). As you'd expect, it will not disintegrate when wet, ensuring that the grounds stay out of your coffee and in the filter where they belong.